NEW PRODUCTS – HDMI 4 Pi: 7″ Display no Touchscreen 1024×600- HDMI/VGA/NTSC/PAL / HDMI 4 Pi: 7″ Display no Touchscreen 1024×600 w/ Mini Driver / HDMI 4 Pi: 7″ Display & Audio 1024×600 – HDMI/VGA/NTSC/PAL « Adafruit Industries – Makers, hackers, artists, designers and engineers! Make a lovely video setup with a 7″ screen at 1024×600 resolution. For this model, we tried to get an inexpensive 1024×600 display that was still high quality and would be good for embedded computing usage. The visible display measures 7″ diagonal and is a ‘raw TTL’ display. 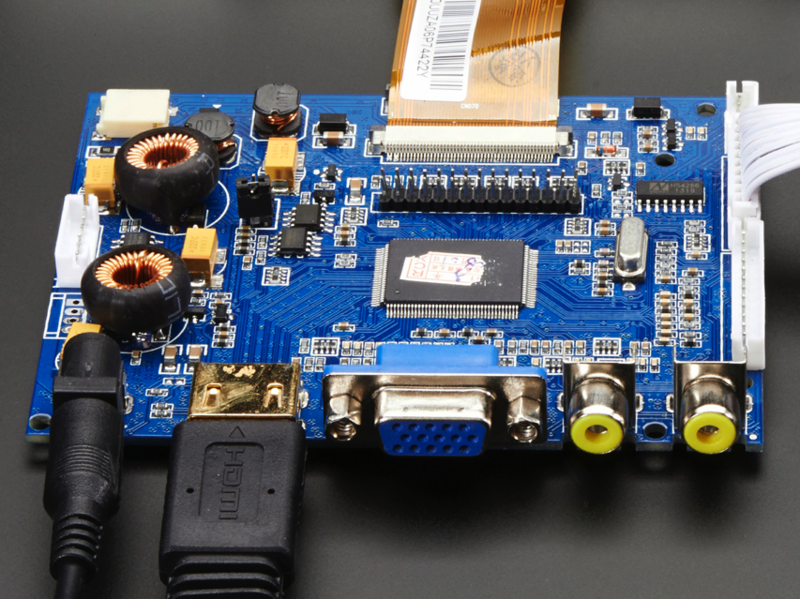 We include a driver board with HDMI, VGA and Composite inputs. The setup is very easy to use – simply connect a 5-12VDC adapter to the 2.1mm center-positive DC jack, then connect a digital video source to one of the ports . Voilà, a display! This version comes in 1024×600 instead of the more expensive 1280×800 display. It’s also not IPS so it’s not good for wide-angle visibility. For use with a Raspberry Pi we suggest editing config.txt to set the HDMI to the native 1024×600 in case it doesn’t detect the resolution properly. You can see our suggested config.txt in the Technical details tab. The easiest way to edit the config.txt is to put the Pi SD card into an every day computer and edit config.txt with any text editor and save. A power adapter is NOT included. You will need to either purchase a 5-12VDC adapter or you can use one you’ve already got around the house. 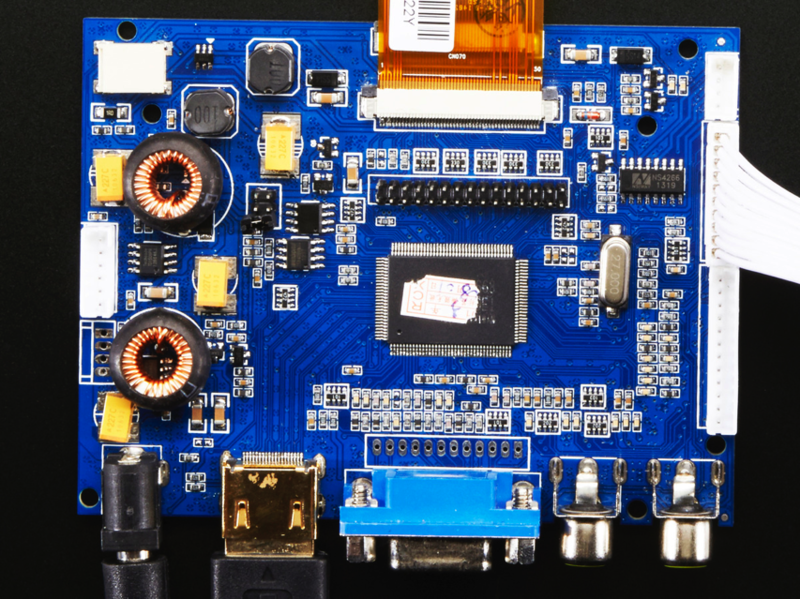 Yes, this is a 7″ TFT display with 1024×600 resolution and a cute little driver board. We tried to get the best medium-size display that would be good for embedded computing usage and at a good price. And we also tried to match it with a small driver board that can be powered from a USB port. The visible display measures 7″ diagonal and is a ‘raw’ TTL display as is used in portable electronics. 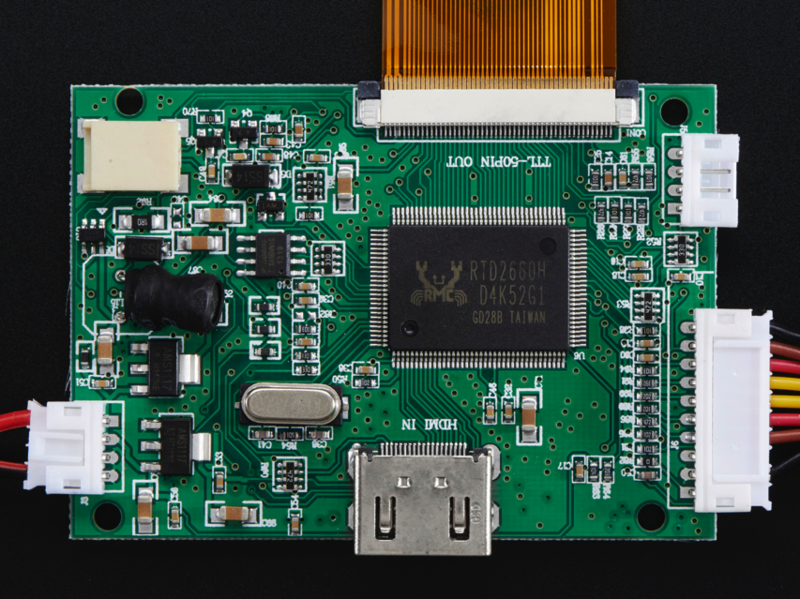 The driver board only has an HDMI input but for Raspberry Pi, BeagleBone Black and other computers, HDMI is the best quality output available. 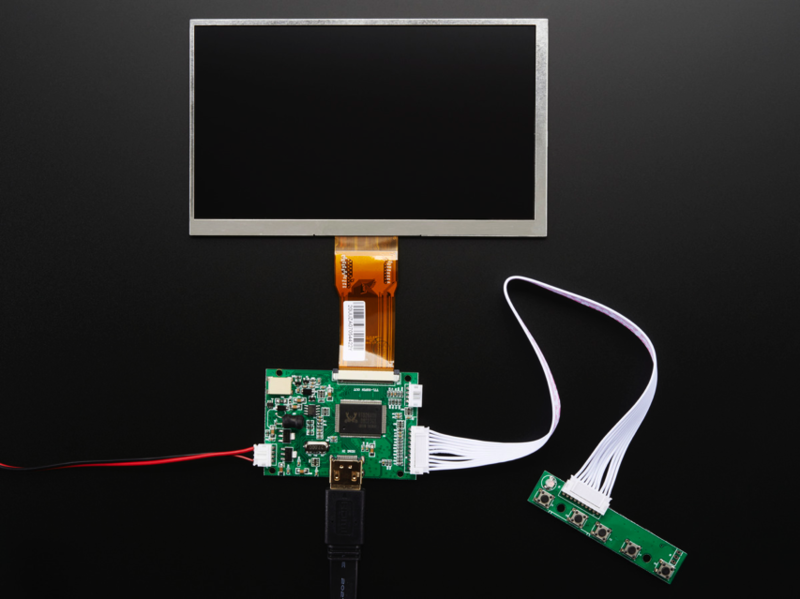 The display is very easy to use – simply connect the USB power cable to 5V power supply that can provide 500mA, then connect a digital video source to one of the HDMI port. Voila, a display! It is not an IPS display so its best for direct viewing, our 7″ and 10″ HDMI IPS displays are designed for any angle view. That said, its the nicest 7″ 1024×600 display we could get. There’s a little wired PCB with little buttons that let you enter a menu system for adjusting brightness, color and contrast. It tries to auto-detect which input you have and switches to that one or you can ‘select’ from the menu keypad which to display. For use with a Raspberry Pi we suggest editing config.txt to set the HDMI to 1024×600 in case it doesn’t detect the resolution properly. You can see our suggested config.txt in the Technical details tab. The easiest way to edit the config.txt is to put the Pi SD card into an every day computer and edit config.txt with any text editor and save. For use with a BeagleBone black, we found it works when plugged in, no configuration required. Yes, this is a 7″ TFT display with 1024×600 resolution with audio-over-HDMI capability! We tried to get the best medium-size display that would be good for embedded computing usage and at a good price. 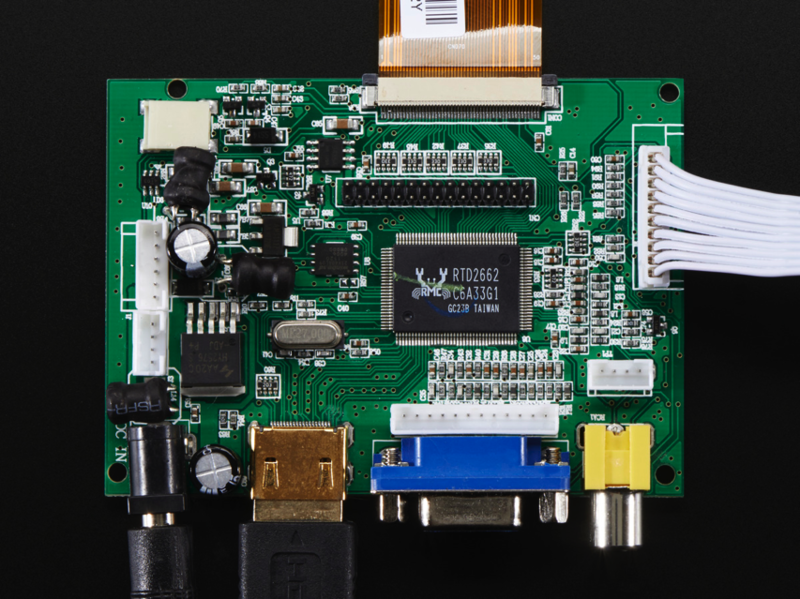 We include a driver board with HDMI, VGA and Composite inputs as stereo 4 ohm at 3W output speaker driving capability. The visible display measures 7″ diagonal and is a ‘raw TTL’ display. The set up is very easy to use – simply connect a 5-12VDC adapter to the 2.1mm center-positive DC jack, then connect a digital video source to one of the ports and two 4 to 8 ohm speakers to the SPK output pins. Voilà, a display with audio! For use with a Raspberry Pi we suggest editing config.txt to set the HDMI to native 1024×600 in case it doesn’t detect the resolution properly. You can see our suggested config.txt in the Technical details tab. The easiest way to edit the config.txt is to put the Pi SD card into an every day computer and edit config.txt with any text editor and save. For use with a BeagleBone Black running Ubuntu/Debian, we found it works when plugged in, no configuration required. We show each of the displays on a bent wire stand which is not included, but you can pick one up here. 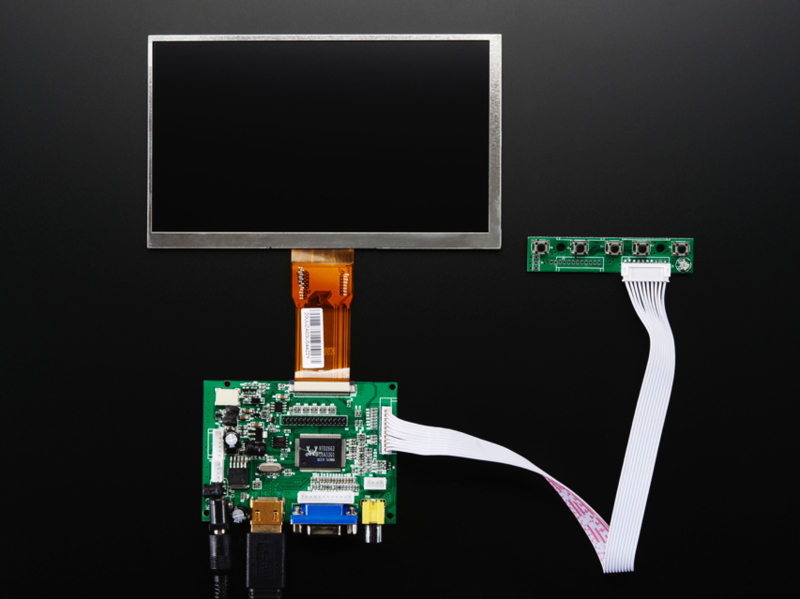 For more information on our HDMI displays, including a suggested config.txt for each one, check out our HDMI Display ÜBERGUIDE!